Have you ever drooled over those Otis Spunkmeyer blueberry muffins in the vending machine or seen the ones they have at Starbucks or Dunkin Donuts? They’re so massively yum looking, yet oh so cupcake-like in their calories. Yes, if you check the calories on most muffins, you may as well opt for the donut. Neither is a bad thing unless you also want to include something else in your meal. Since I love making small batches of things so that they don’t have friends hanging around calling (or screaming) my name, I decided to try making a small batch of blueberry muffins. It satisfies my blueberry muffin craving but is lower in calories than the kind you get at the store. Plus there are only a few. You can eat them all or eat them one at a time. Preheat oven to 350 degrees. Use three silicone muffin cups or line a muffin tin with 3 muffin liners. Mix all of the ingredients but the blueberries until blended. Stir in the blueberries. Divide evenly into the muffin cups, filling about 2/3rds full. Bake at 350 degrees for 20-22 minutes. 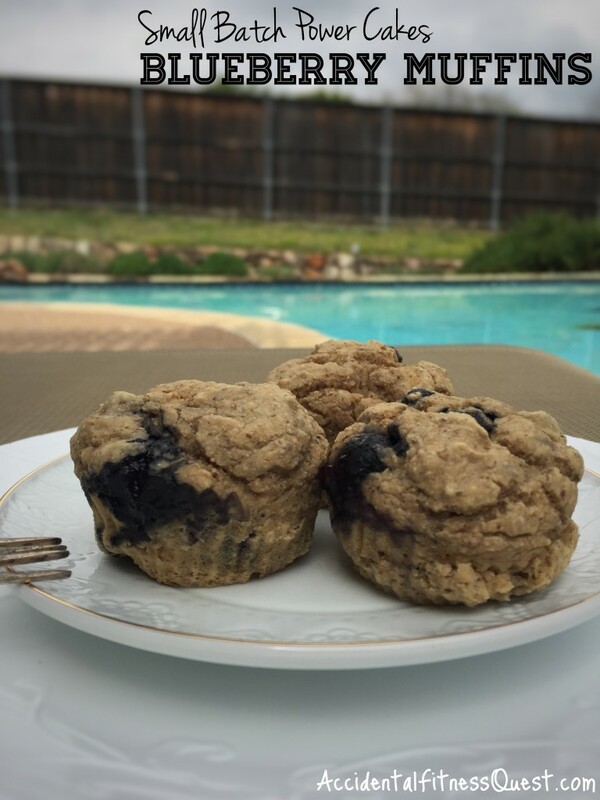 Makes 3 muffins at approximately 77 calories each – 4g protein, 13g carbs, and 1g fat. I used my homemade version of Kodiak Cakes Power Cakes Pancake and Waffle Mix but you can use the real thing if you prefer. I used regular applesauce which is sweetened, so I didn’t need to add sugar since they were great with the sweetness of the blueberries. If you like a sweeter muffin, you can add a tablespoon of sugar or stevia before baking. The muffins are great enjoyed with a cup of coffee in the afternoon, crumbled into greek yogurt at breakfast, or even just eaten when the mood hits. Even if you decide to eat all three in one sitting, they’re still way lower in calories than the store bought and they’ve got a nice punch of fiber and whole grains. For other goodies to make with the power cakes mix, check out the baked power cakes donuts and the tiramisu donuts. You can also go the normal route and actually use the mix for pancakes and waffles too. 😉 If you’re interested in working with me to get meals together fast while working towards your health goals, I’d love to chat. Drop me an email, or come on over to Facebook and ask a question.